A quiet day in Kampala with SimonPeter and Lisa and lovely lunch in Cafe Javas in the centre of the city. An afternoon reading before a late evening drive to theAirport for our 11.30 departure from Entebbe. Should be back in the UK before 9.00am tomorrow. 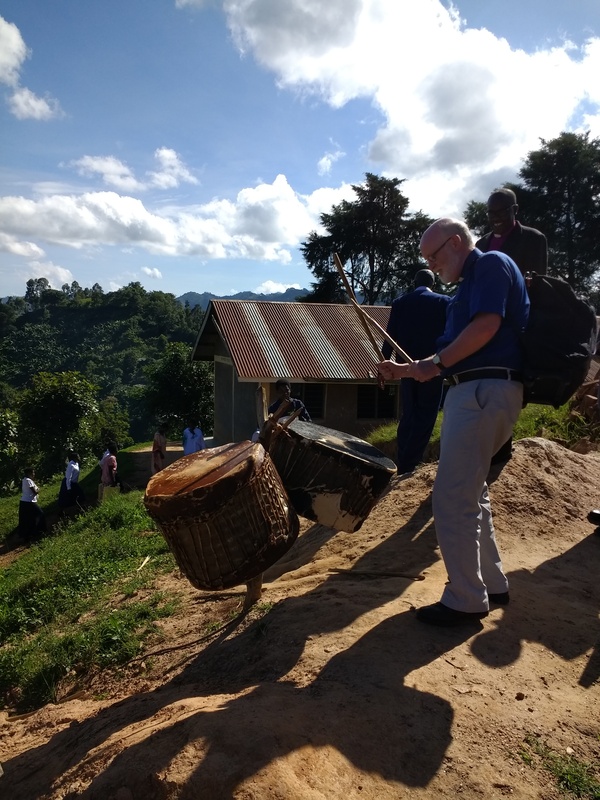 This is the last of our posts from our trip to Uganda. 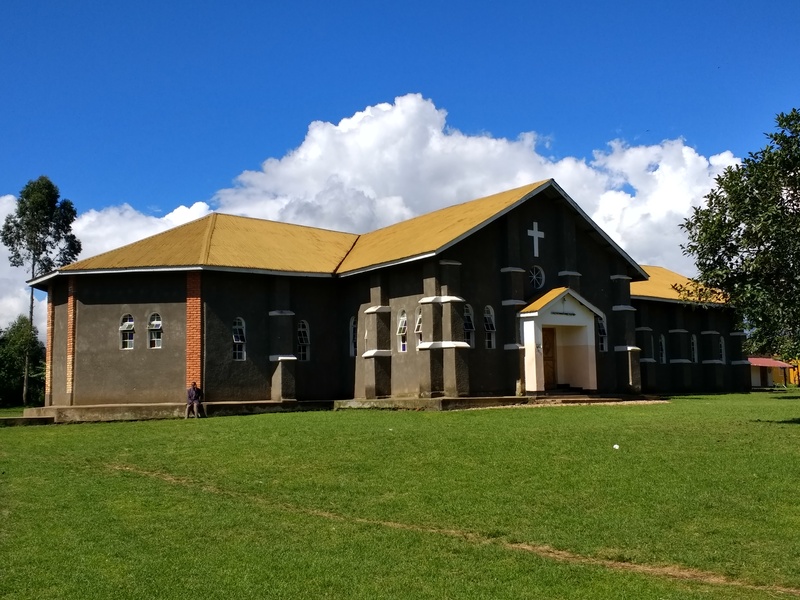 This entry was posted in Uganda on May 16, 2018 by rogerfarnworth. Up at 6.00am ready for a prompt 7.30pm departure from Kisoro. Cranmer was up to send us on the way with a prayer for safety on our journey. 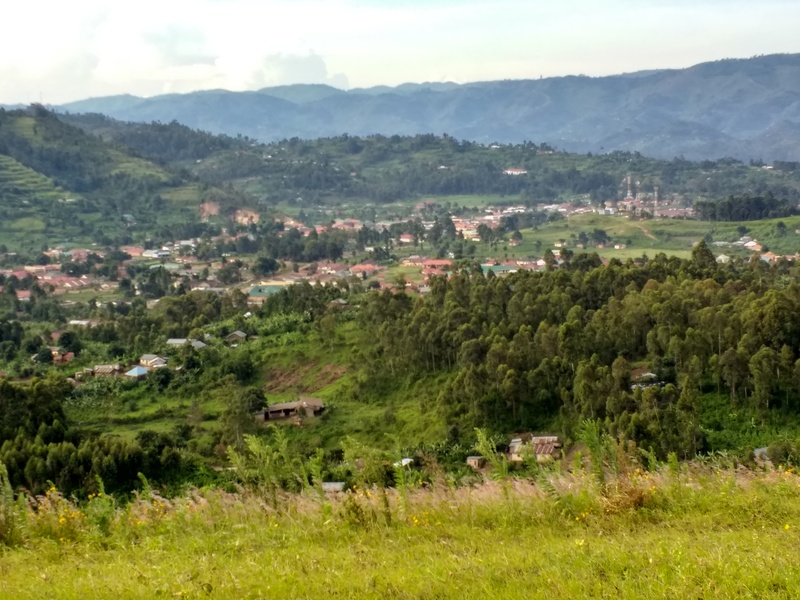 A comfortable and relatively new car picked us up and as we climbed over the pass between Kisoro and Kabale we found ourselves in thick early morning cloud. 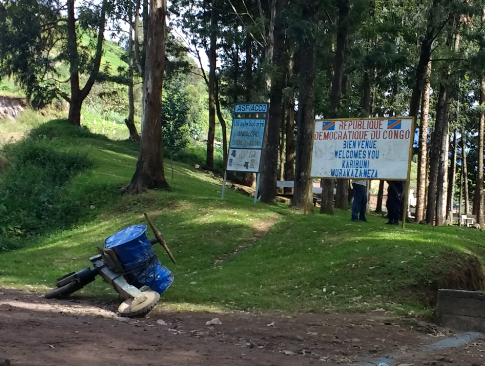 We encountered a lot of slow moving lorries on the road and did not pass through Kabale until 9:10am. 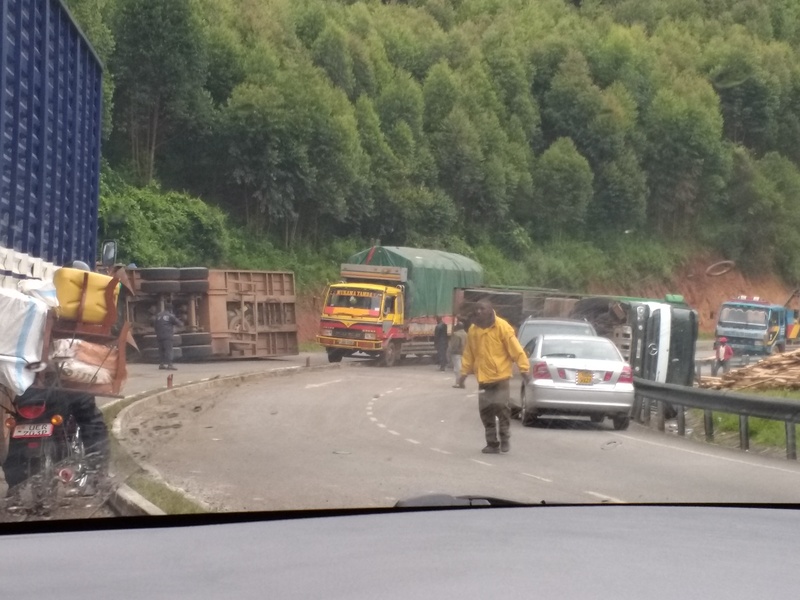 We then encountered a significant accident between two lorries on the steep hill down from the Kabale hills. It looked as though a lorry and trailer tried to take a sharp bend at too great a speed. 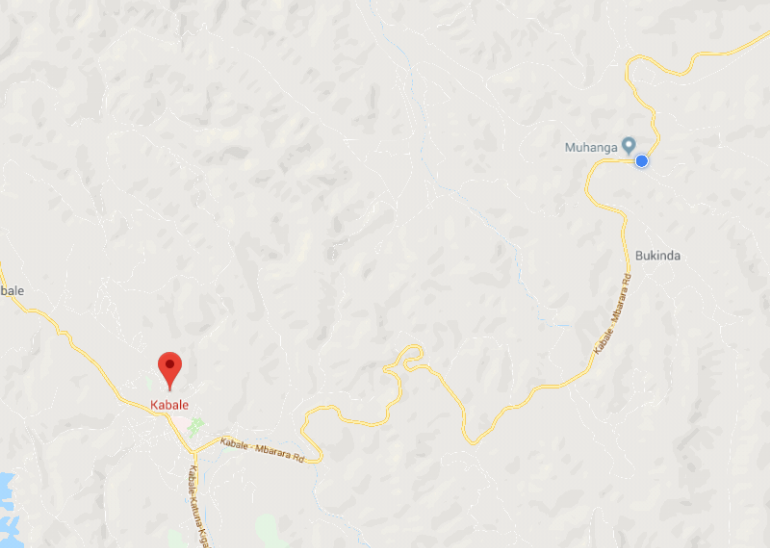 From Kabale to Muhanga we drove through steady heavy rain. Just after Muhanga we hit thick fog with visibility down to little more than a car-length in front of our vehicle. The rain intensified once we cleared the worst of the fog, so it was still very difficult to see through the windscreen! 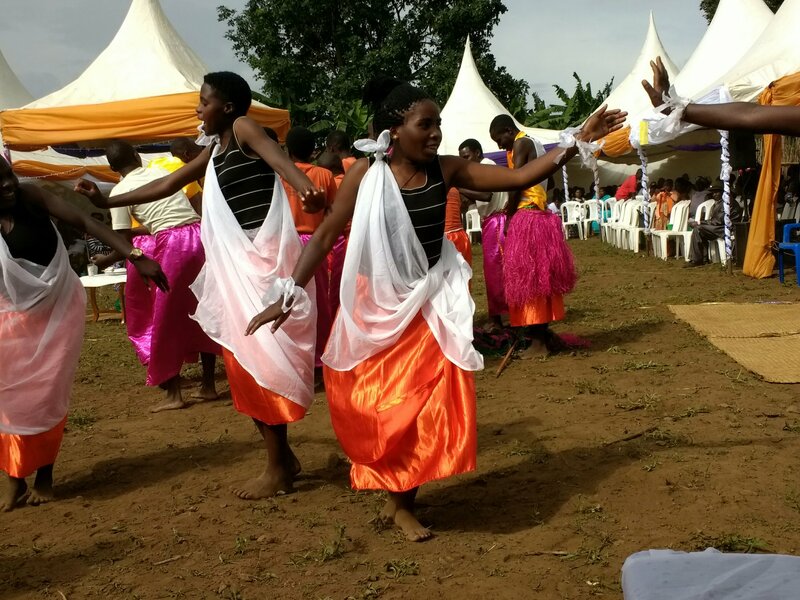 Rain and low cloud continued through Ntungamo and the Ankole hills, and on to Mbarara. By the time we reached the Mbarara by-pass at about 11.00am then weather was beginning to lift. 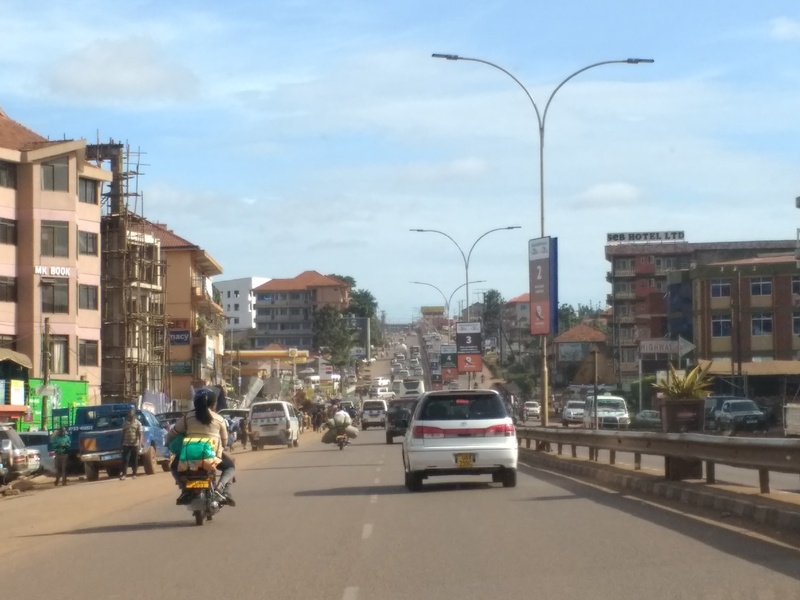 The road between Mbarara and Masaka is older tarmac and the traffic heavier, the humps harder to see. 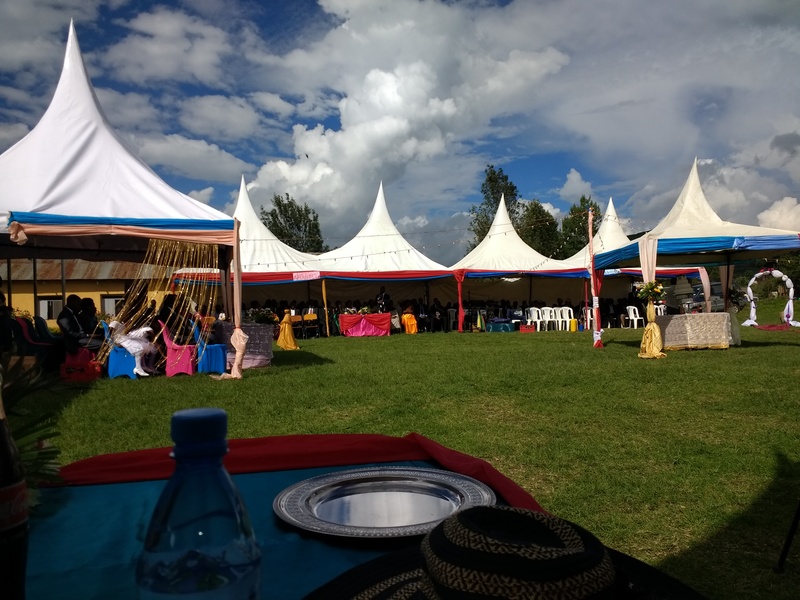 By the time we reached Masaka (1:00pm) the clouds had lifted somewhat and the rain had stopped. 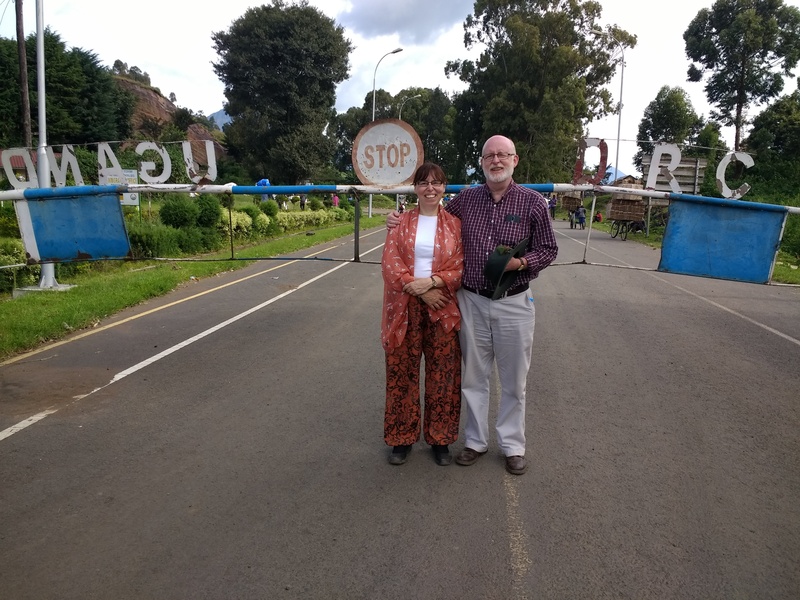 We stopped at the Equator (but didn’t get a photo at the circles) for a lunch of guacamole and sweet potato chips at AidChild’s Equation Cafe’ and Gallery, Kayabwe. 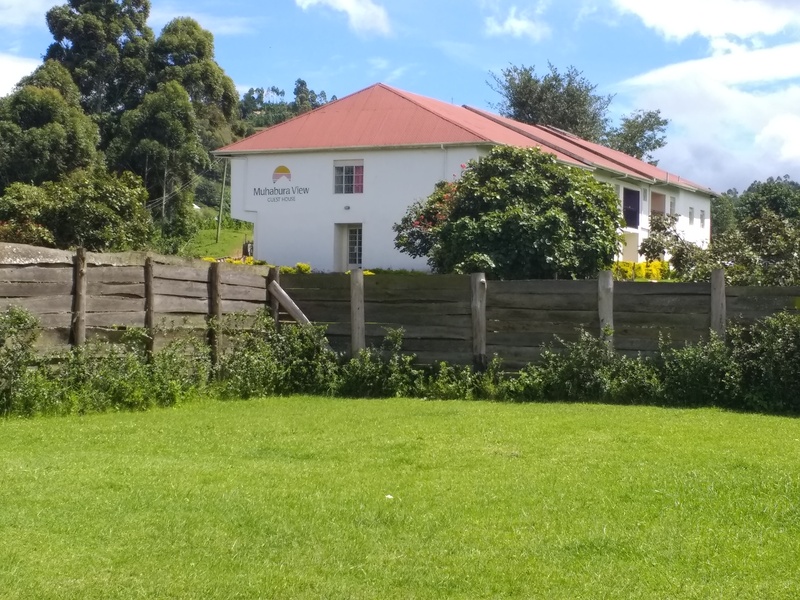 Arrived safely at Whitecrest Guest House at 4.30pm. 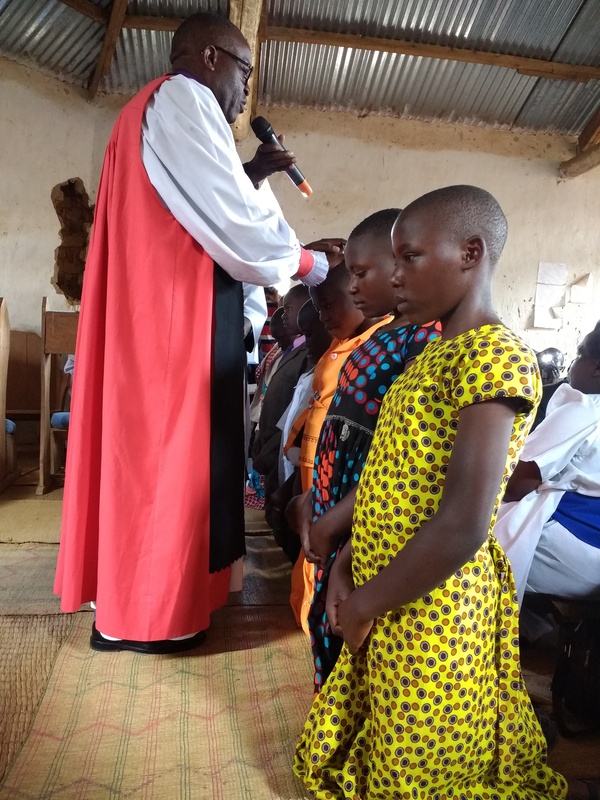 This entry was posted in Uganda on May 15, 2018 by rogerfarnworth. 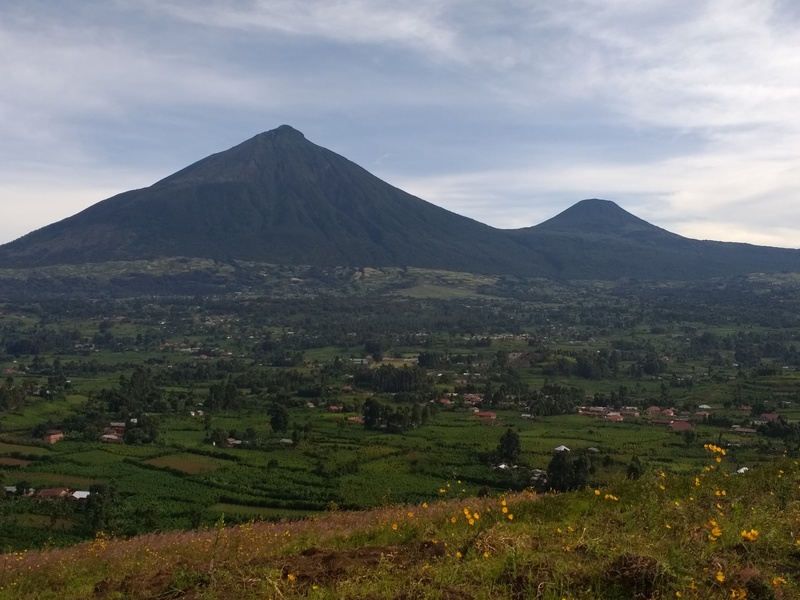 A gentle morning started for Roger with an early rise to watch the dawn over Kisoro and Mt. 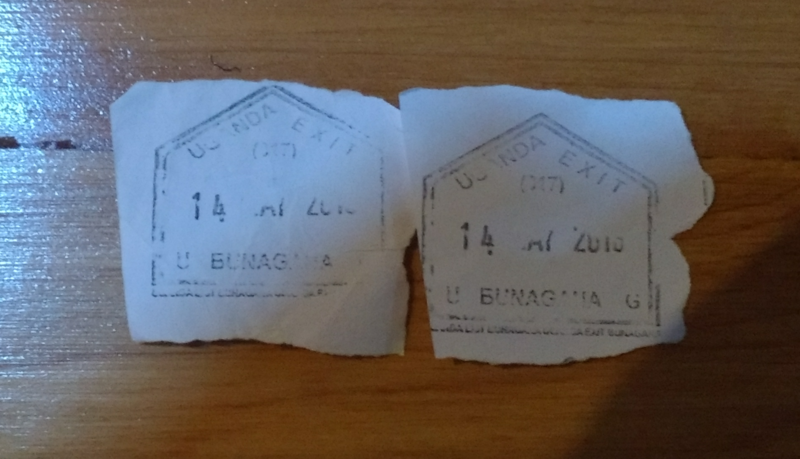 Muhabura and to post images on Facebook. 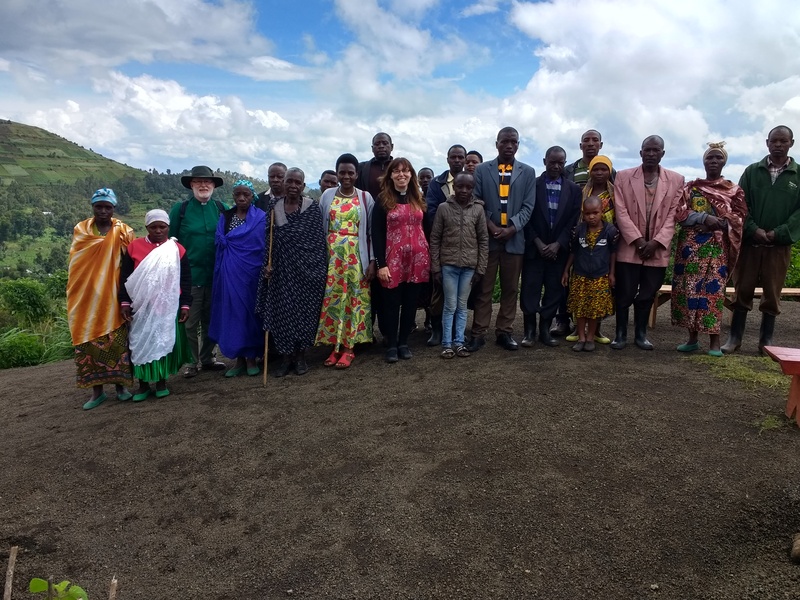 Today is our last full day in Kisoro. We travel to Kampala tomorrow. It will be a 7 hour drive. Bishop Cranmer has negotiated a good rate for us for the journey. 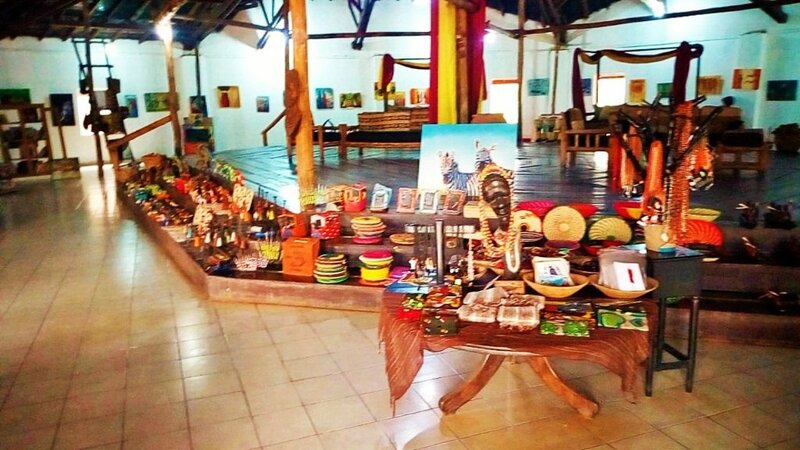 It will cost us 570,000 UgSh ….. sounds a lot but it is about £120 at the local exchange rate. 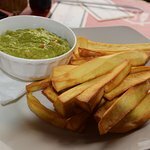 Mid-morning we walked into Kisoro and did a little shopping before having lunch at The Coffee Pot – Guacamole and Chapati. 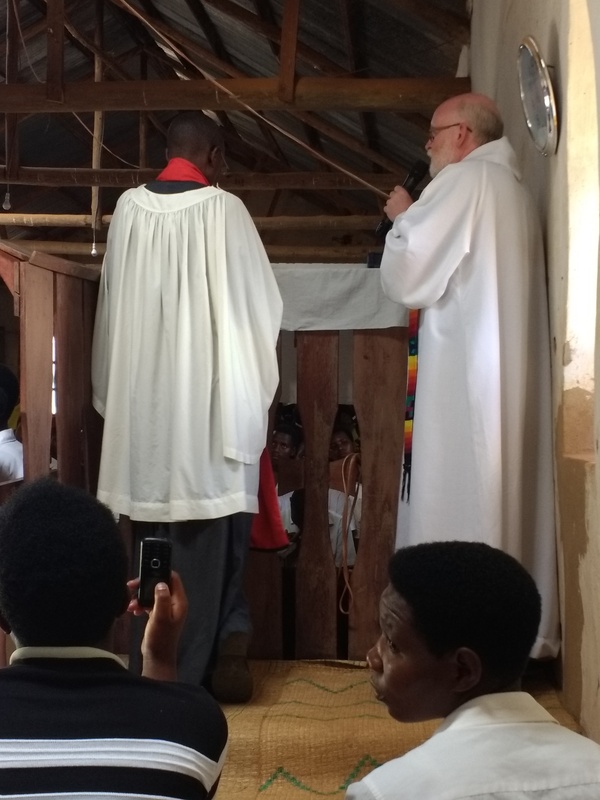 In the afternoon, Bishop Cranmer took us to the border with the Congo and we were given permission to cross and return by customs officers. We had a different experience at the border gate at the other end of the crossing. The customs officers for the DRC were great, they allowed us to enter the DRC temporarily and even gave permission for photographs to be taken, but then a relatively young man not in uniform who had a big car, called us over and threatened to put Cranmer in jail, then he took my phone and scrutinised all the photographs before giving us a stern rebuke for taking photograph without permission. We wondered who he was, the customs officers told us to take no notice of him, they had given permission for the photographs. 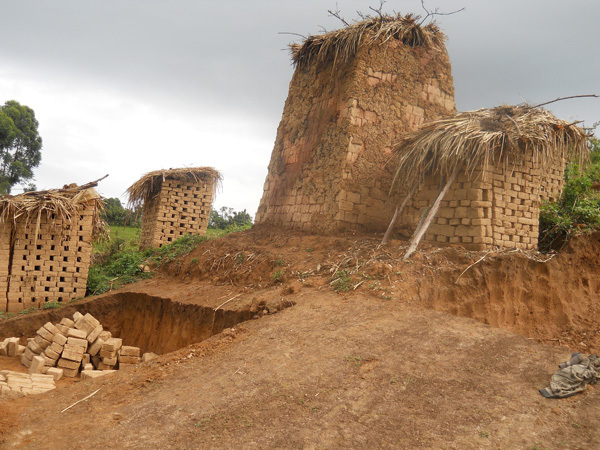 Still, it leaves one wondering, ……… given that government structures are weak in the DRC and given the story in the news recently of two British people being kidnapped and then released in the eastern part of the Congo. Anyway, we got our 10 minutes in a different country!☺ We got a few photos to prove it, and Roger did not, in the end, lose his phone! 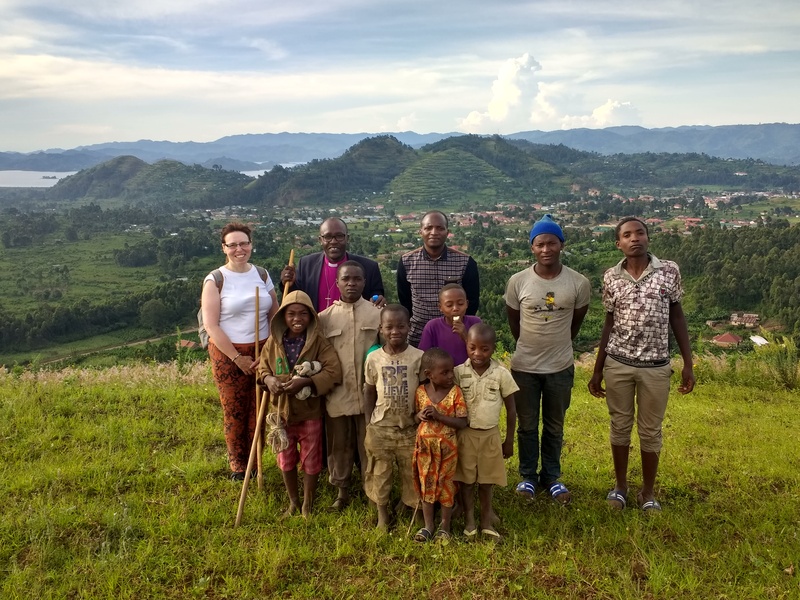 After our border experience, we stopped off on the south side of the main road at a small hill, Sagitwe and climbed it. In the past, it was a volcano and the caldera still remains. The whole hill is intensively farmed. 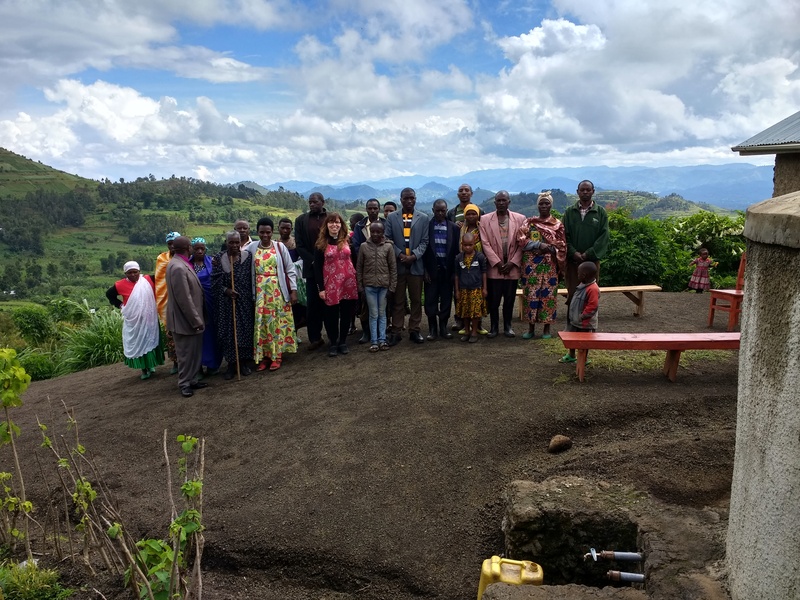 At the top we also had a good view of the Virunga Mountains. We spent the early evening with Cranmer and Hope, and then completed our packing. Our home over the past week has been Muhubura View Guesthouse (http://www.muhaburaview.com) which is owned by the Diocese of Muhabura. 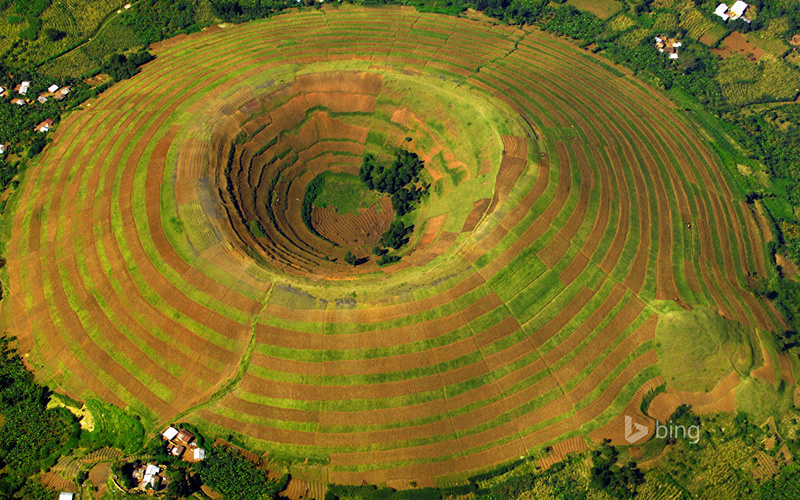 It sits on a hill overlooking Kisoro and the Virunga Mountains. 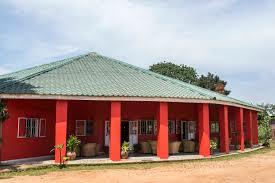 The Guest House from the Bishop’s compound. It is very close to the Bishop’s house. 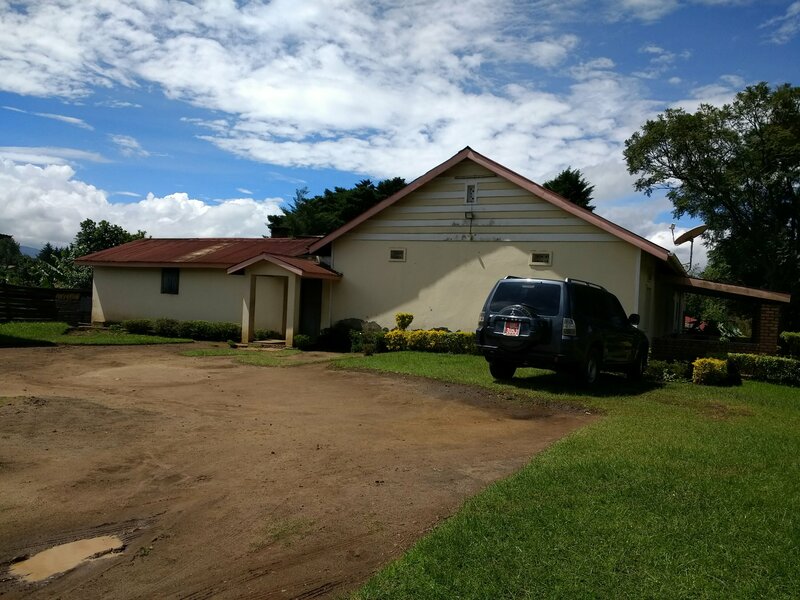 This entry was posted in Uganda on May 14, 2018 by rogerfarnworth. First order of the day after arriving was our second breakfast. 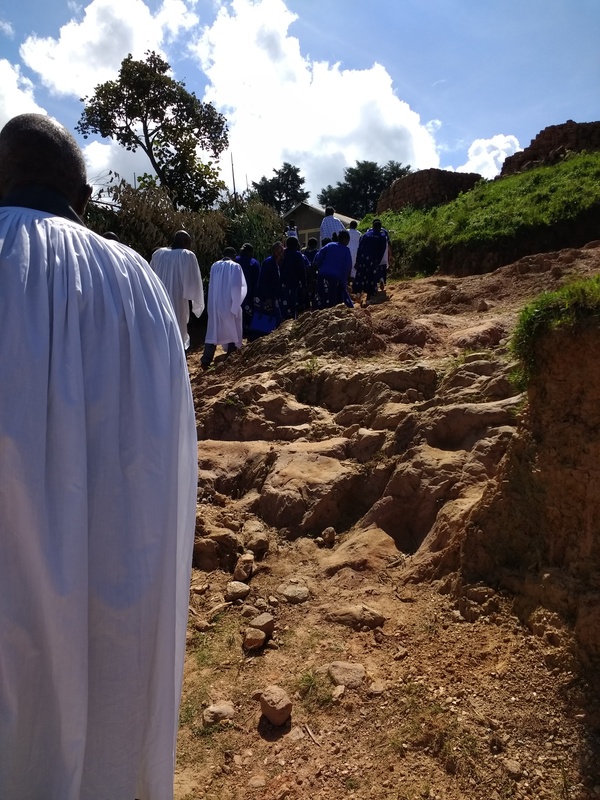 The processing up hill (steeply up hill) to the church. 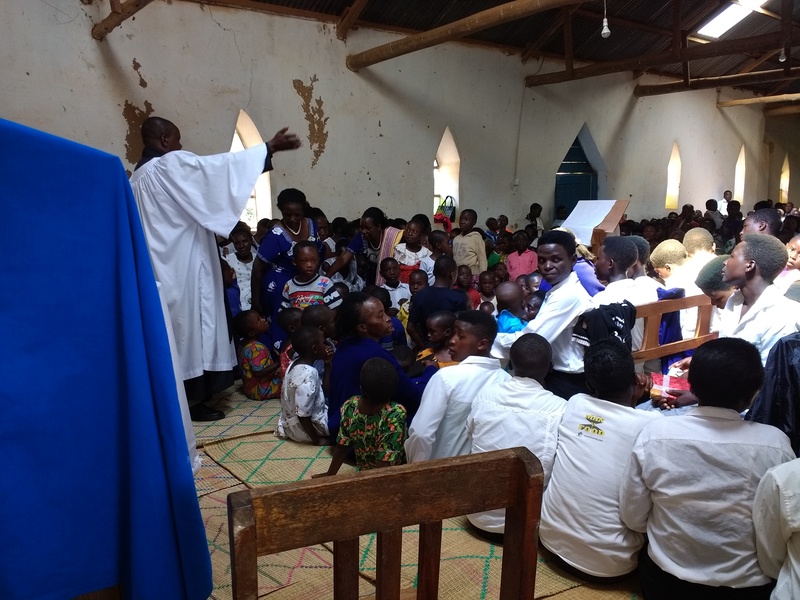 The church was packed (literally – there was no room to process to the altar as the aisle was full of young adults and children sitting on the floor). The church was roasting hot😥, but we loved the service and Roger got to preach for 45 minutes. It is a pity that cannot happen often in Ashton-under-Lyne!😏 Should we try to make it possible? Do not fear, for I have redeemed you, I have called you by name. You are mine. (Isaiah 43:1-4). 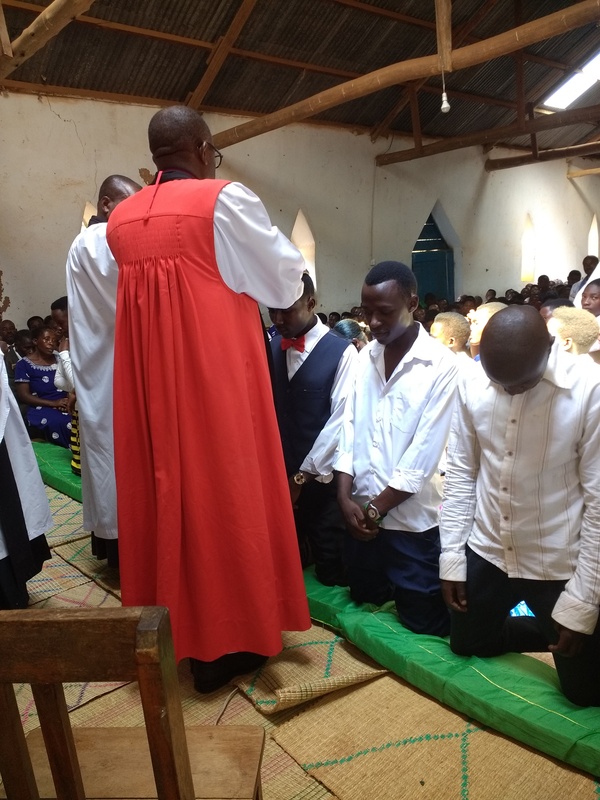 33 young people and one adult from Buhozi parish were confirmed. 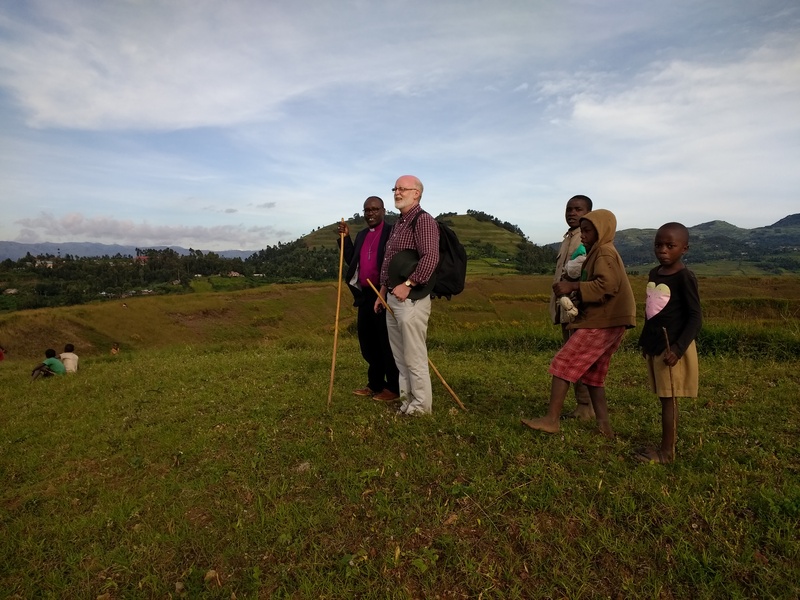 It was about 1.30pm when we processed back to the vicar’s house for lunch and 2.30pm when we left to head back to Kisoro. 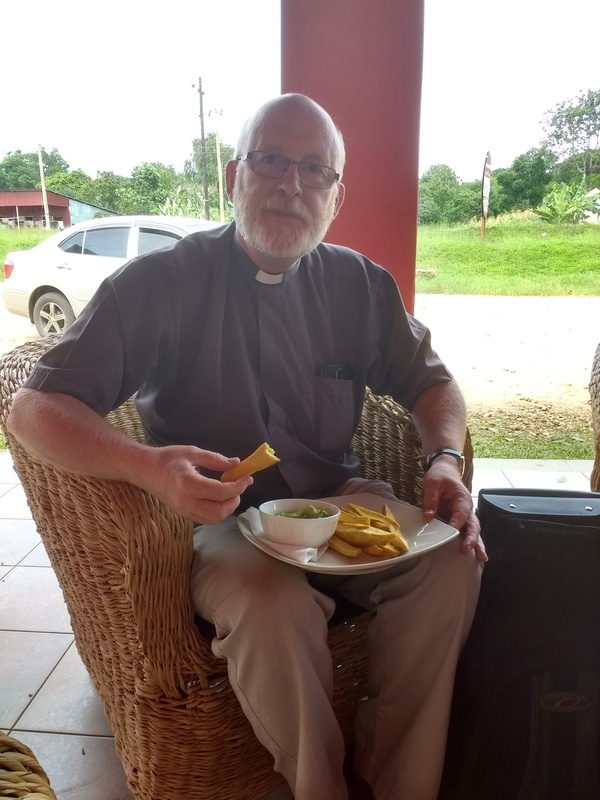 Two pastoral visits with Bishop Cranmer completed ‘work’ for the day. 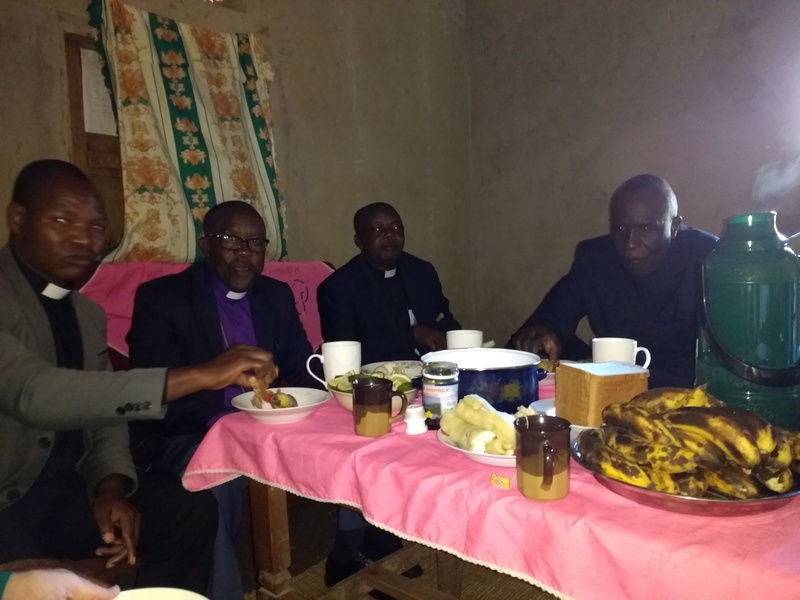 The evening was spent at the Bishop’s house with a meal prepared by Phoebe their youngest daughter. 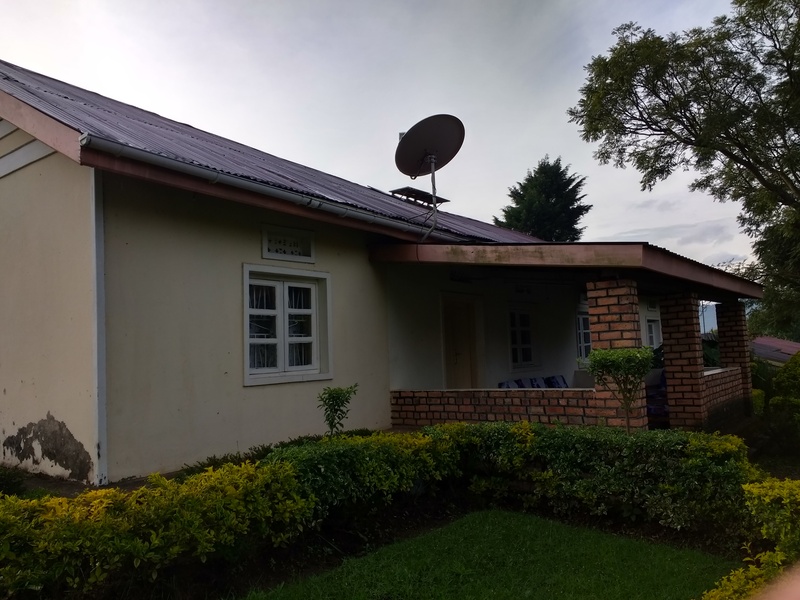 This entry was posted in Uganda on May 13, 2018 by rogerfarnworth. 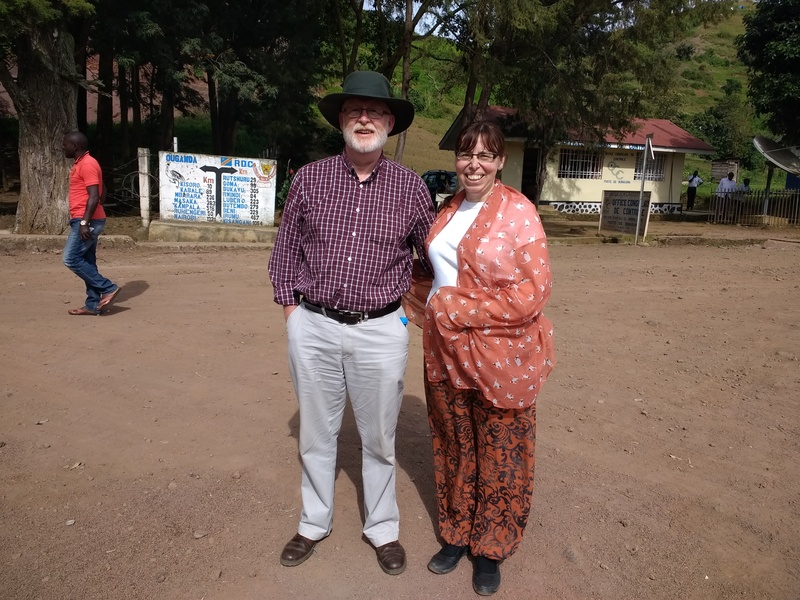 During a relaxed morning we strolled down into Kisoro to visit the Coffee Pot Cafe to say thank you for my birthday cake and enjoy a cup of Ugandan coffee. We added extra data onto the local SIM that we have, and changed some more money. 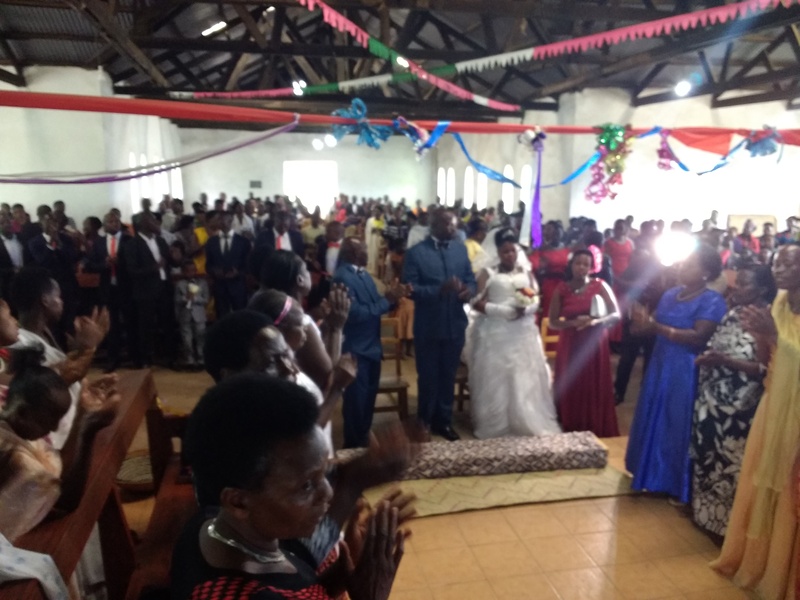 By 12 noon we were at St. Andrew’s Cathedral for the first of two weddings today. There are plans to build a new cathedral. 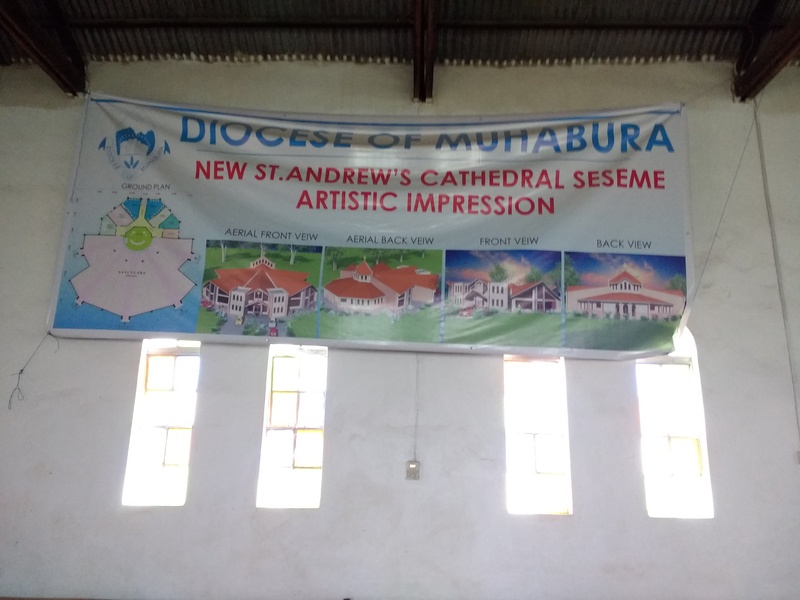 They are in an advanced stage of development but the diocese has been advised that they should not start the project until they have at least 500 million UgSh set aside which will cover the cost of the foundations. It sounds a lot of money but it is approximately £100,000. 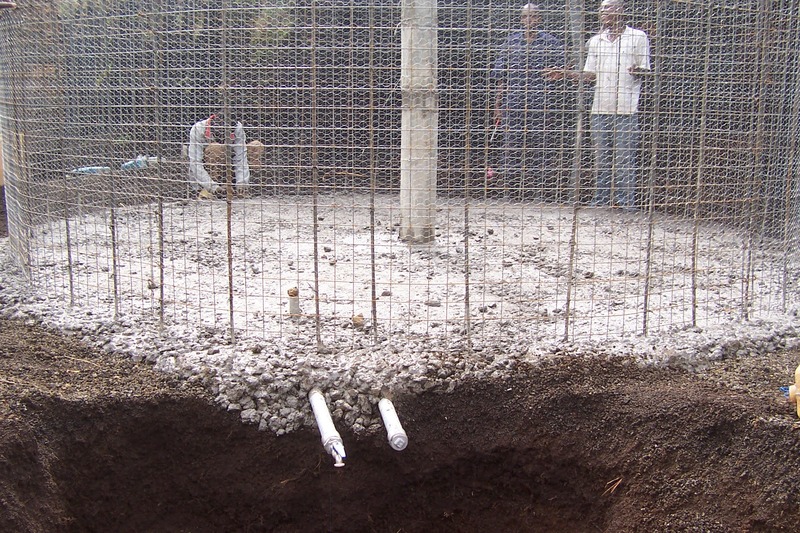 I doubt we’d get the foundations of a new cathedral in the UK anything like as cheaply as this. 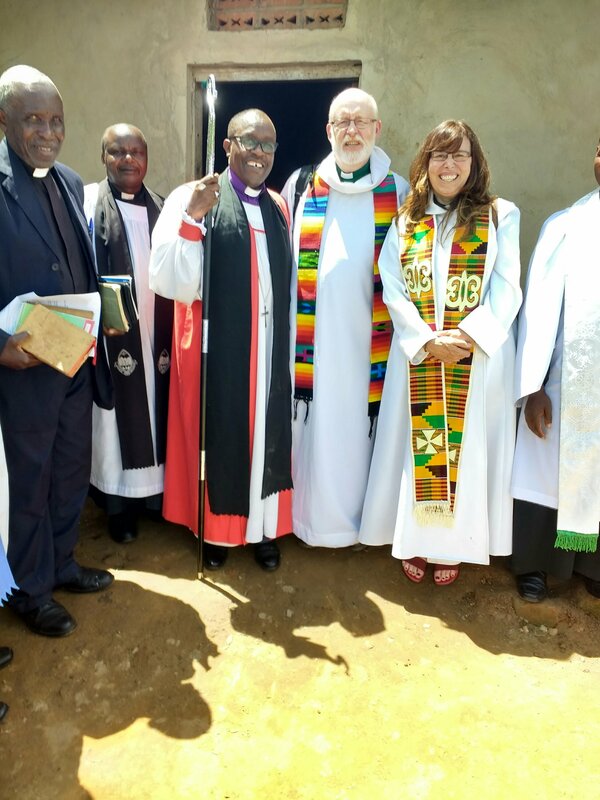 Then on with Bishop Cranmer to Sooko for a second wedding. After which we enjoyed going to two wedding receptions in one day! 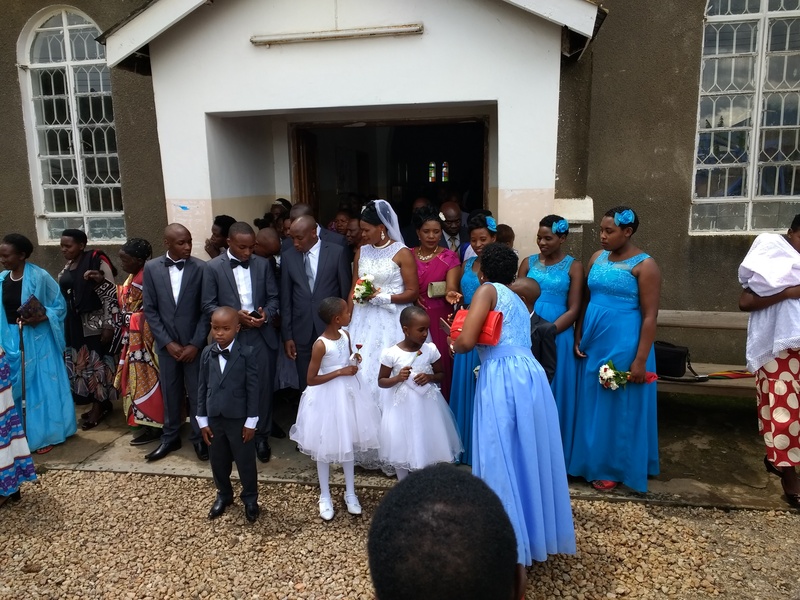 They took place within a hundred metres of each other in Kisoro town! Another full day! 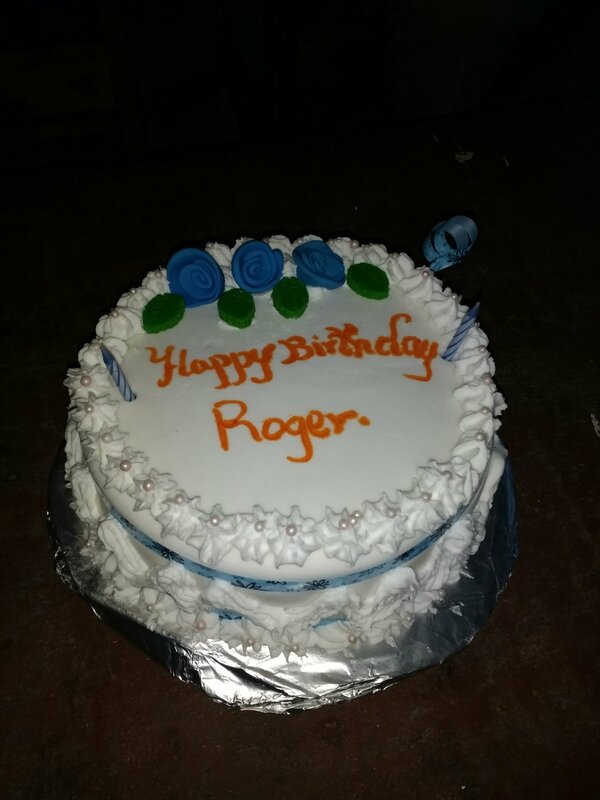 11th May, oops, Roger nearly forgot it’s his birthday! 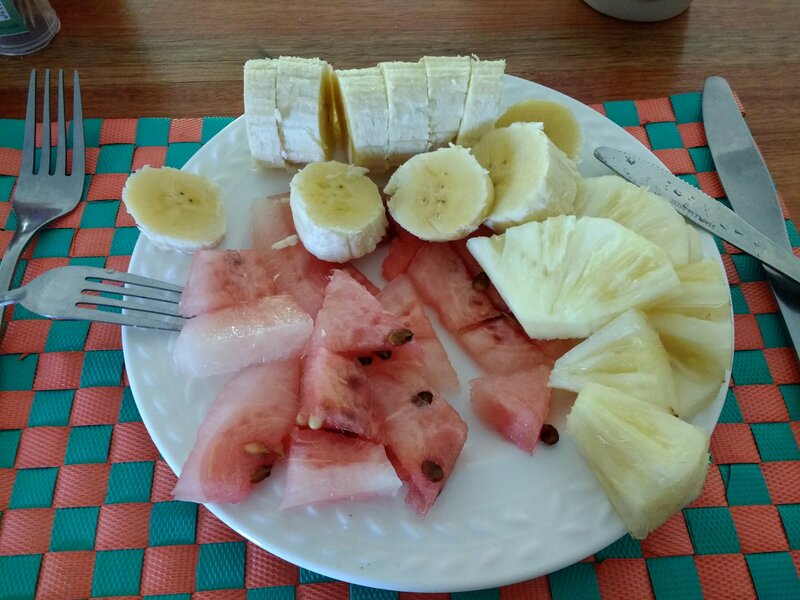 An early start this morning, after a good breakfast. 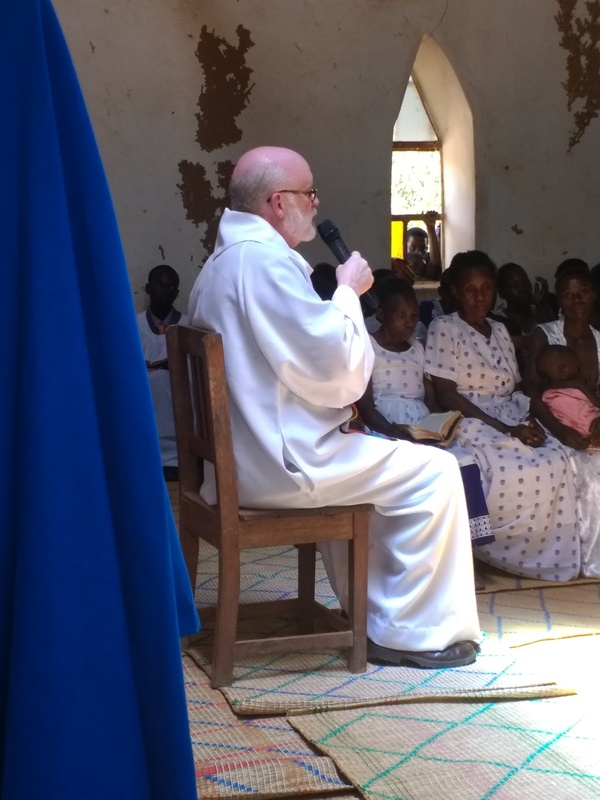 We travelled to Nshungwe on the DRC border for a parish confirmation service. We arrived at 10.00am after an hour’s journey over murram roads. Unusually, in this area, the roads were very sandy. 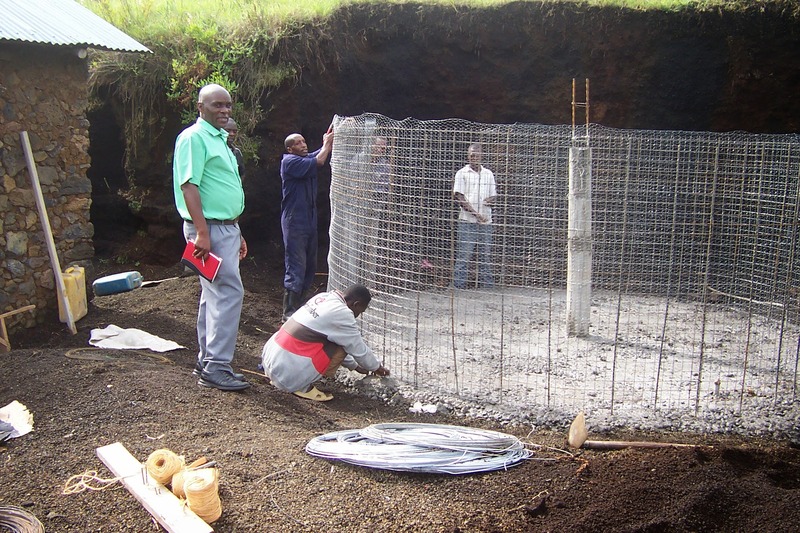 Most roads are pumice stone and dark soil in the Kisoro area. 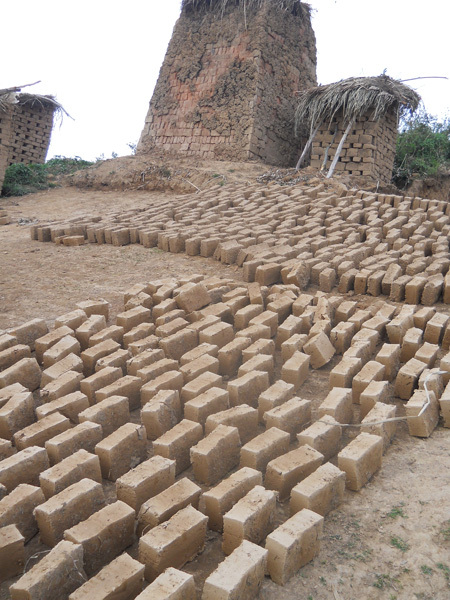 A major income earner in this part of the diocese is making bricks. When we arrived, breakfast was served! 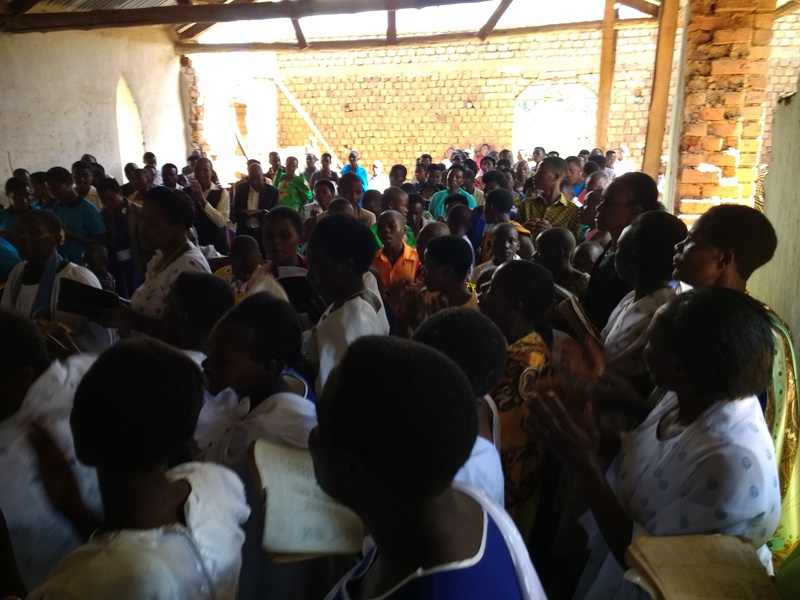 We robed and walked up to the church which was full! 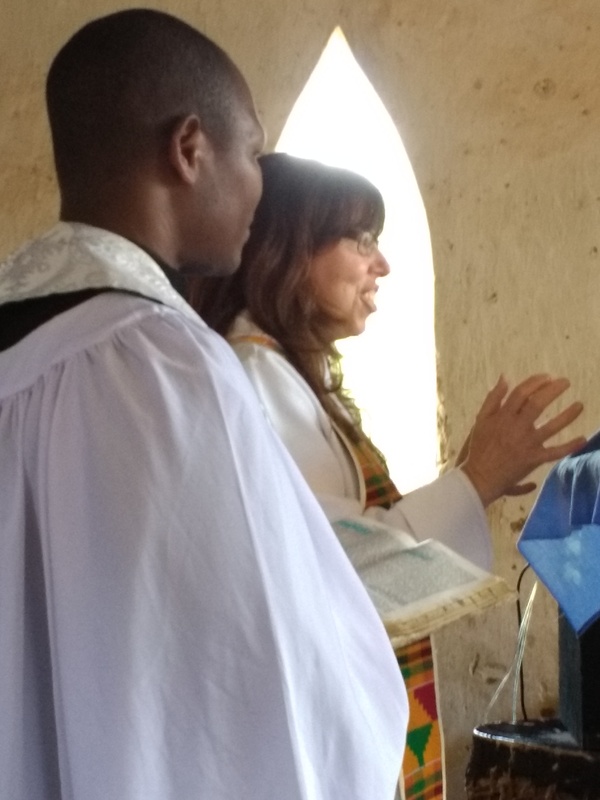 The 28 confirmations preceded the sermon which Jo enjoyed preaching. 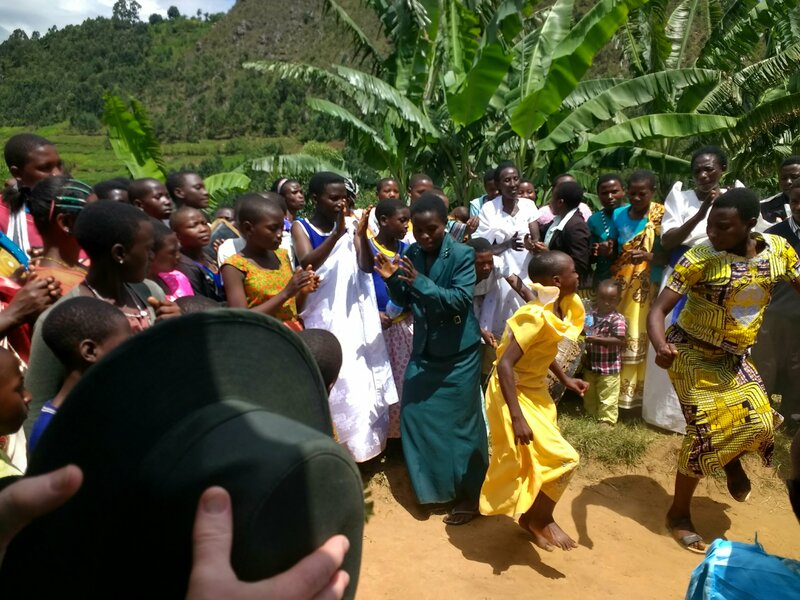 After the service there was some traditional dancing which Roger ended up getting caught up in! 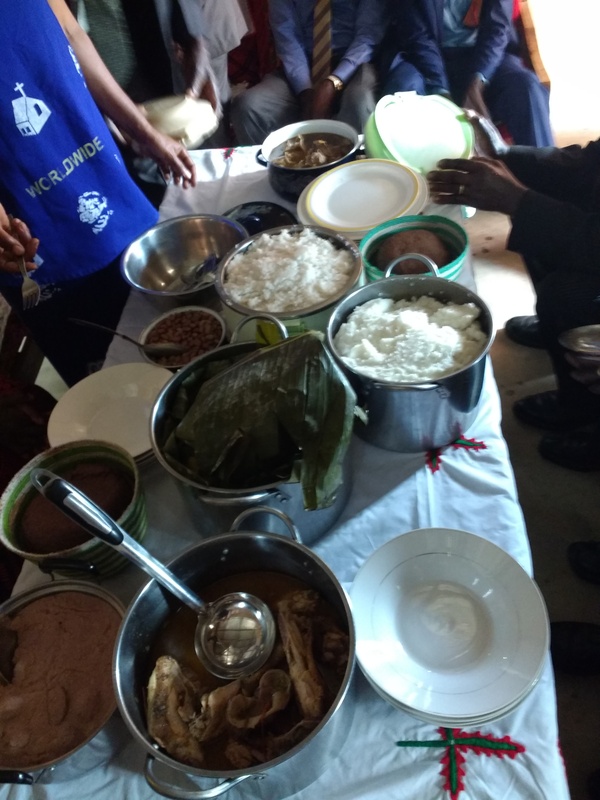 We were then given lunch before we set off back towards Kisoro. 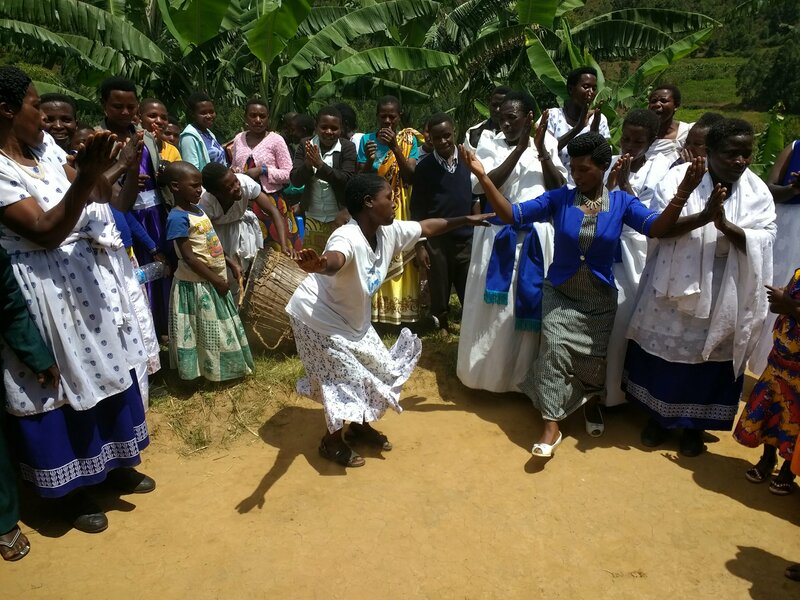 We spent 6 hours in all, travelling and at Nshugwe. We had a quick visit to our room before heading out again. 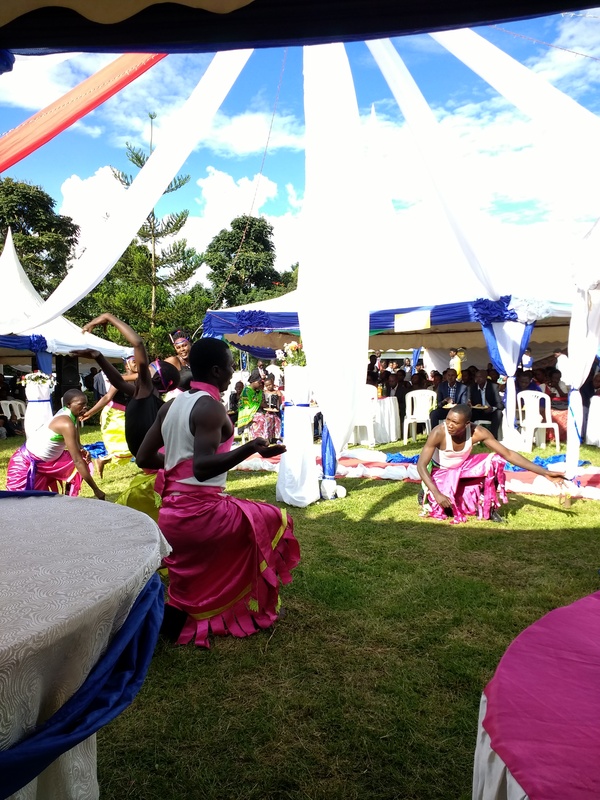 We enjoyed a visit to the giving-away ceremony which precedes one of tomorrow’s weddings. 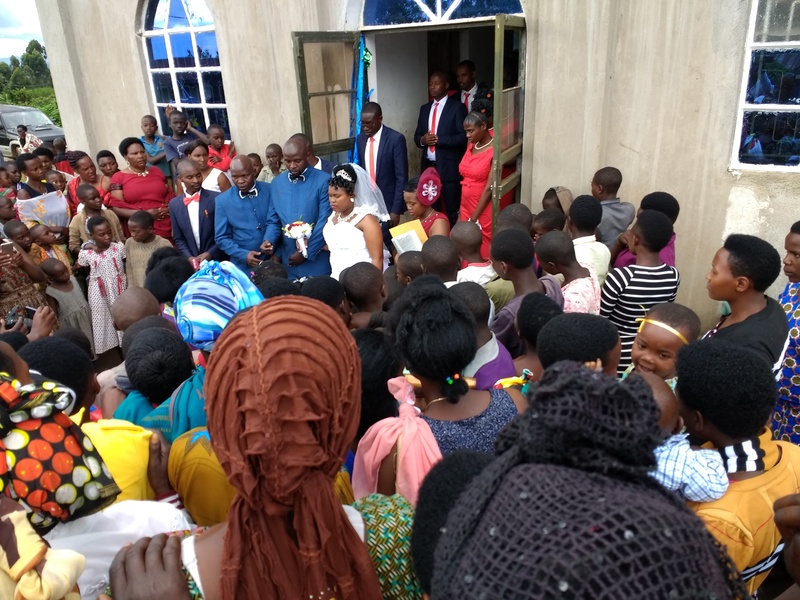 Local custom has the bride being bartered over at the giving-away ceremony before her family agree to her becoming part of her future husband’s family. This is largely ceremonial now-a-days. 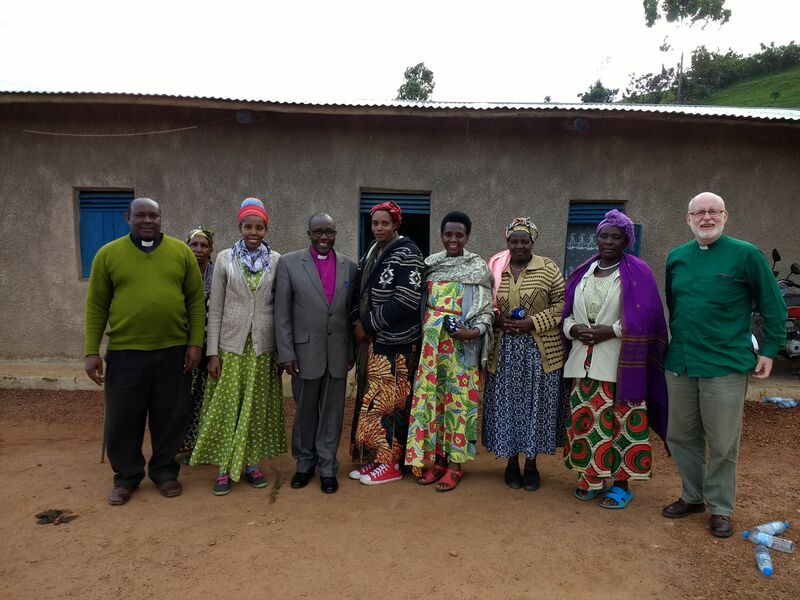 After this we joined members of Cranmer and Hope’s families at their home after the death of one of the family. We were glad to get back to the Guest House after what was a very long day. 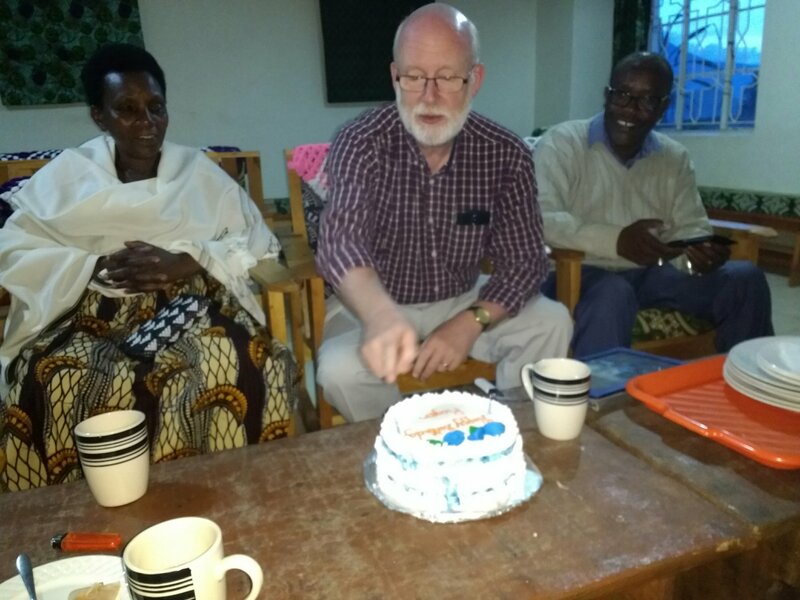 Somehow during the day, Jo conjured up at cake for Roger’s birthday and we shared it with Cranmer and Hope. 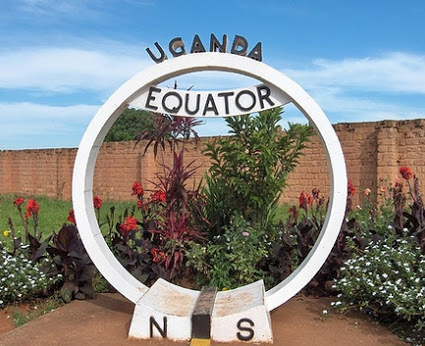 This entry was posted in Uganda on May 12, 2018 by rogerfarnworth. 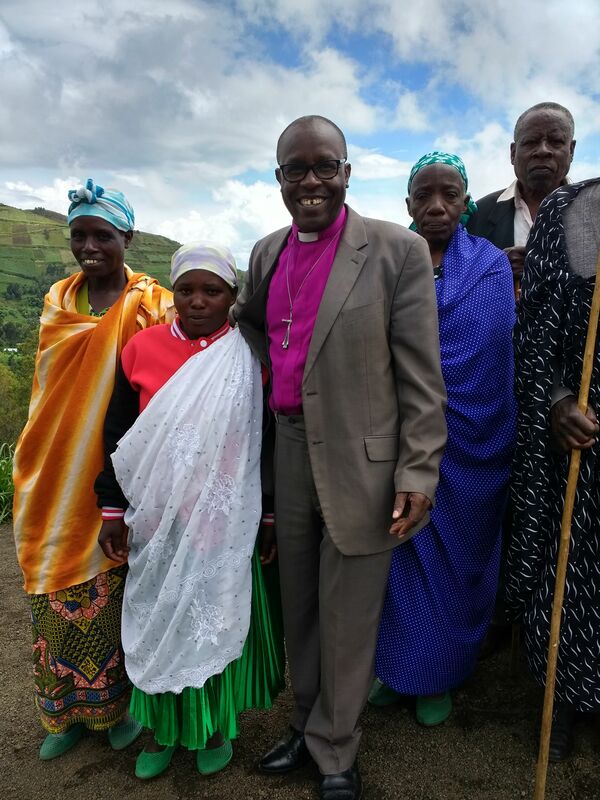 Today is Ascension Day, we have not climbed a mountain but we are living at approximately 1800 metres (around 6000 ft) above sea-level and the two villages we visited today with Bishop Cranmer and Hope are much higher. Hopefully that counts! 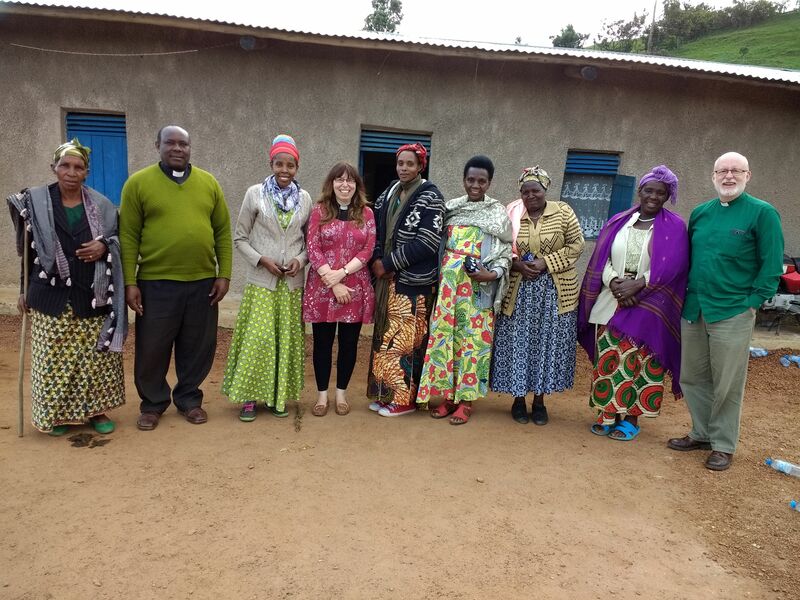 In the morning we travelled to Nyakimanga a small highland village right on the border with Rwanda, I guess it is about 2000 metres above sea level. 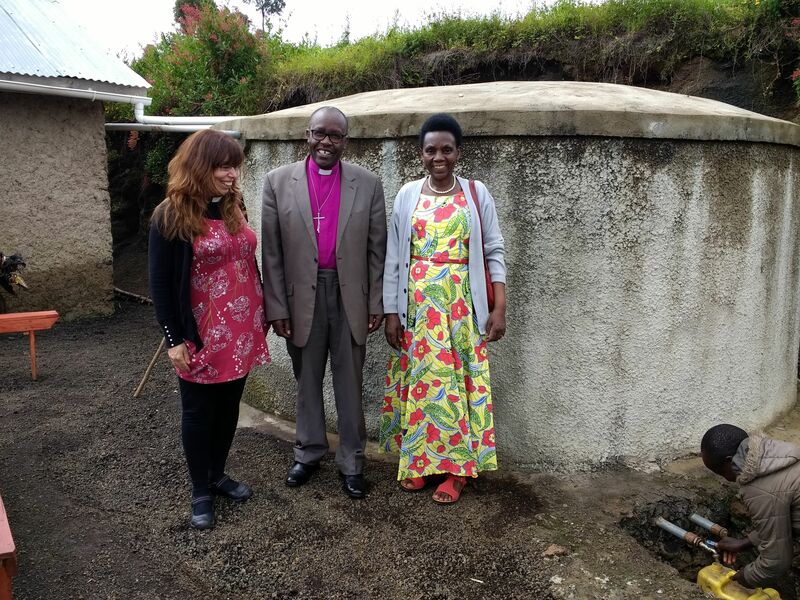 Our parishes in the UK funded a water tank for this village at harvest-time 4 years ago. 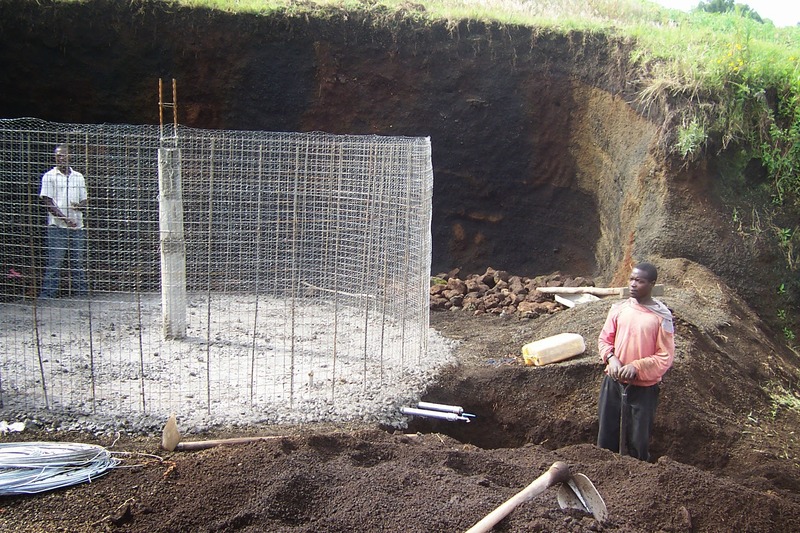 Jo and I visited in October 2013 to see the village and to see where the tank would be built (it was the dry season). 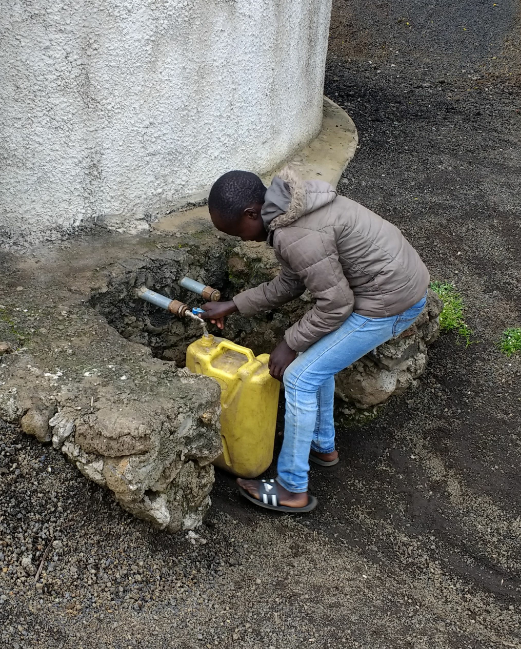 Children were walking long distances to collect water and so were unable to attend school. I visited again in April 2015, when the tank was under construction. It was the wet season and the scenery was much greener. 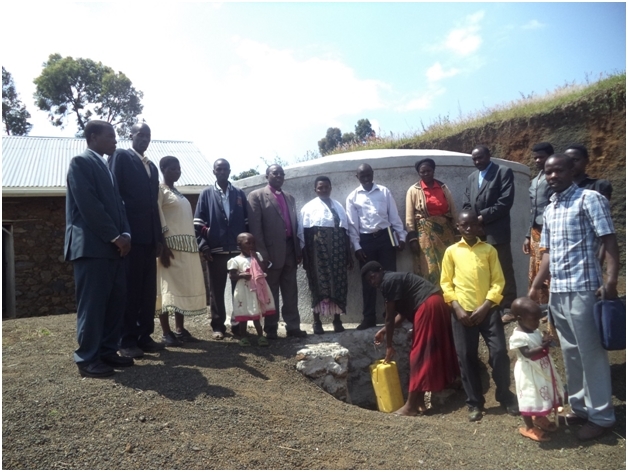 In July 2015, Bishop Cranmer sent a photograph of the inauguration ceremony for the new tank. Today we have been able to see the tank completed and see just how important it is to local people. 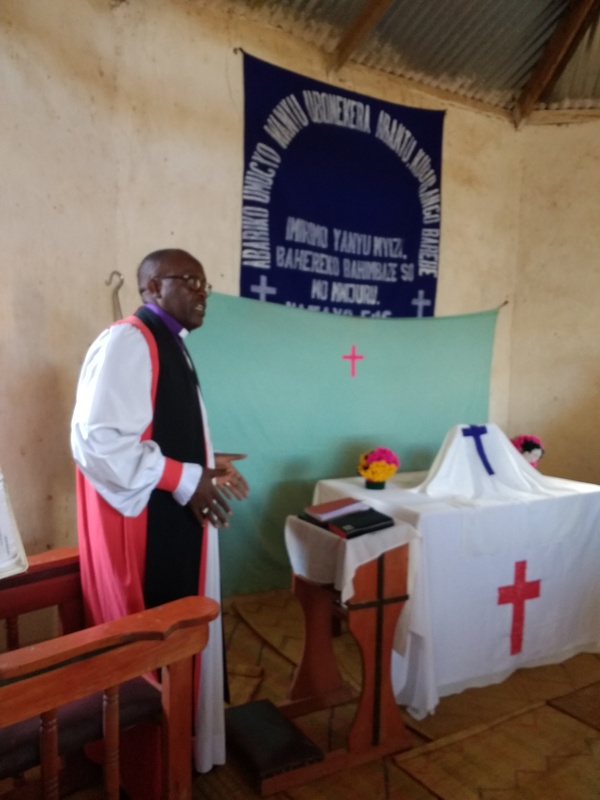 Nyakimanga is in the south of the diocese. 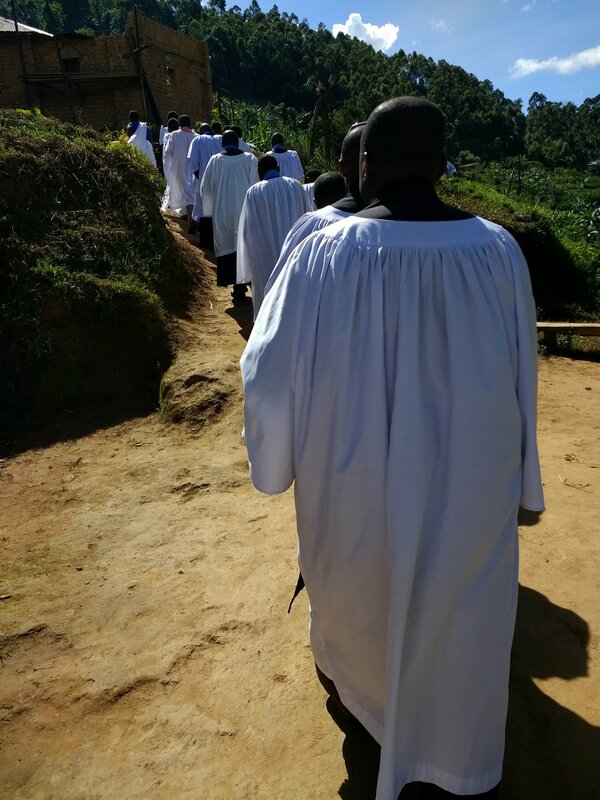 Our afternoon/evening visit took us to the northwest of the diocese and meant travelling out of the diocese on the main road to Kabale and into Kigezi Diocese, before turning off onto murram road and heading back into Muhabura Diocese. 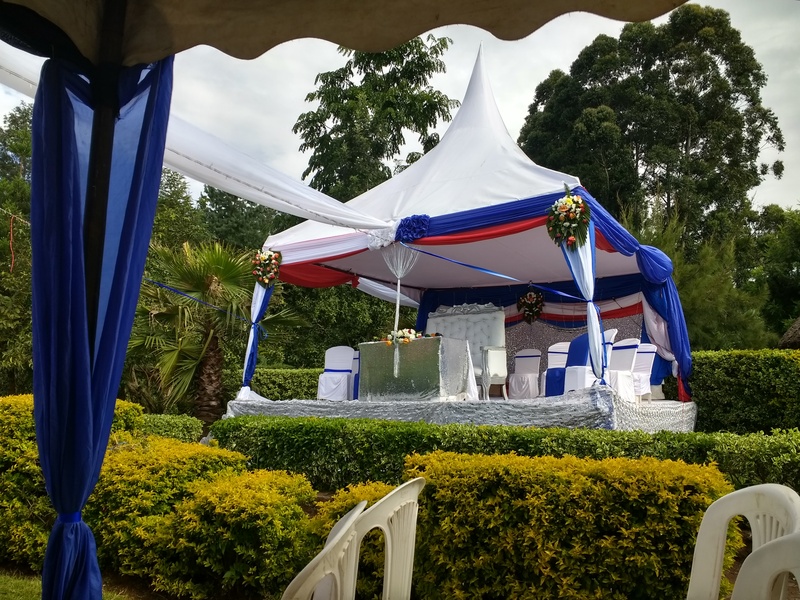 This was another visit to a family in mourning. 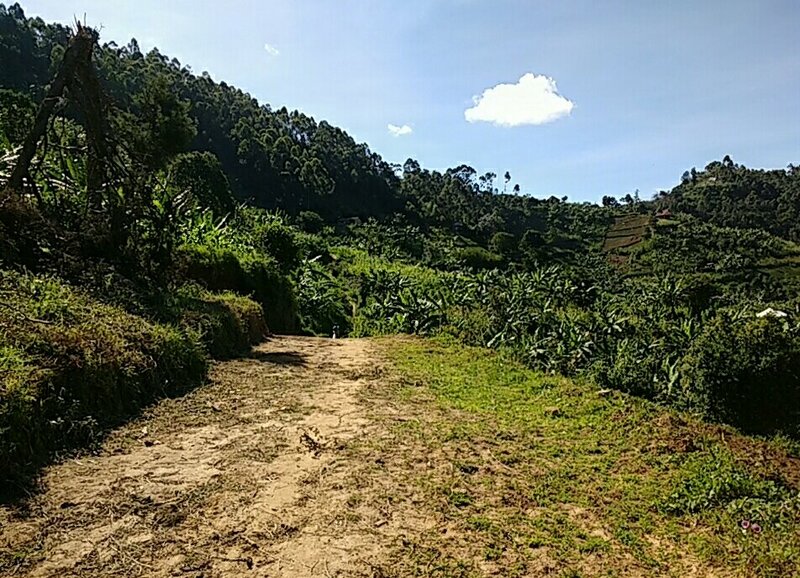 This entry was posted in Uganda on May 11, 2018 by rogerfarnworth.